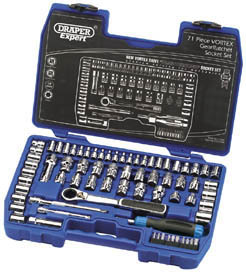 Expert Quality, socket set containing both Draper Expert VORTEX and conventional sockets. Manufactured from chrome vanadium steel hardened, tempered, chrome plated and polished for corrosion protection. The unique hollow socket technology of the Draper Expert VORTEX ratchet and sockets is ideal for long fixings. The sockets are edge driven. This allows a fixing to pass through the head and avoid the depth restriction of conventional sockets and ratchets. Packed in blow mould carrying case and display sleeve.